The Ready Set made a very special club at appearance at The Mint on a Sunday night, presenting a lively 8 song performance for both longtime fans and industry types. 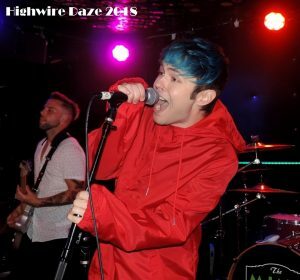 And judging by the vibrantly energetic show and the adoration from the fans – there is no doubt that The Ready Set thoroughly impressed even the most jaded of record label bigwig. Fronted by the charismatic and multi-talented Jordan Witzigreuter, The Ready Set is at the crossroads of an already brilliant career, recently unveiling the V1-EP – a self-released endeavor showing an artist at his most impassioned and ambitious. Witzigreuter and his rock solid band performed selections from the V1-EP as well as many other fan favorites that absolutely captivated the room. Opening the set with No Halos, the first track from the V1-EP, The Ready Set had The Mint audience singing along early on, demonstrating just how strong and magnetic the new material is. A raging pop rocking version of Freaking Me Out from The Bad & The Better was then unleashed, a song that really makes you want to rip it up all over the dance floor. After revisiting Killer from Feel Good Now, it was time to once again deliver the V1-EP goods, and the one-two punch of Let U Go and Life In Pink showed The Ready Set at the very height of their creative prowess. The breezy Disappearing Act from I Will Be Nothing Without You Love was up next, the playful melodies and gripping lyrics with its dazzling “the sky belongs to me” denouement leaving an indelible impression. Those who wanted memories from the glorious past were treated to Love Like Woe and show closer Give Me Your Hand (Best Song Ever), concluding the night in nothing short of an epic way. Affiance will release “No Secret Revealed” Nov 30 on Bullet Tooth!